Let’s start with the fallacy of their reasoning. The Ten Commandments tell us to remember the Sabbath day and keep it holy. For the Hebrew people for whom this commandment was intended, that meant much more than our current Christian practices. For them the Sabbath began at sundown the night before and ended at sundown of the Sabbath itself. For the Jews that meant no work of any kind and a lot of time spent in the synagogue. Our measly one hour mass on your choice of days (Saturday or Sunday) seems rather pitiful by comparison. But, for now, that’s what the Church asks of us. “But who died and left the Church in charge of my life?” Simple: Jesus died and left the Church in charge. He said to Peter, “You are rock and on this rock I will build my church.” Then He said to Peter and the Apostles, “Whoever hears you hears me.” Some critics will say that Jesus was speaking only to the twelve and that this authority doesn’t apply to today’s church. Well, take a look at what the eleven remaining Apostles did after Judas’ and Jesus’ death. They were alone and afraid. They were hiding out because their lives were in danger. Yet they took time to appoint another Apostle to take Jesus’ place. Clearly they had the authority to do that and they felt that it was an urgent need. There had to be twelve. It was the beginning of Apostolic succession. New Apostles (bishops) are appointed and ordained by existing bishops. I wrote this just the other day, “If you don’t believe everything Jesus said then He’s a liar and you can’t believe anything He said.” I’d add to that that if you don’t believe everything He said, then you shouldn’t call yourself a Catholic. Doing so makes you a liar because you don’t believe what Catholics believe. You can paint white stripes on a black horse but it doesn’t make him a zebra, even if he says he is. Here’s another thing that these so-called Catholics overlook. 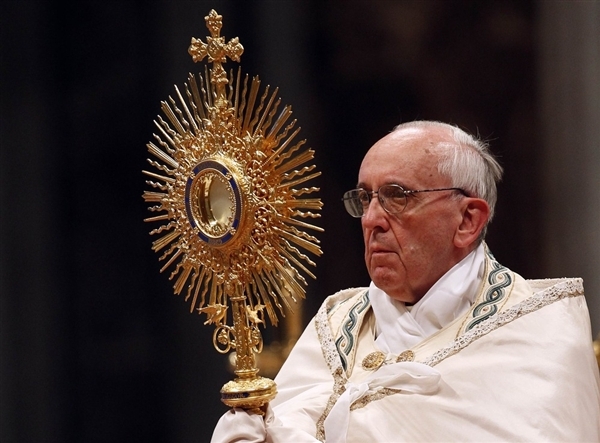 Jesus left us with the sacrament of the Eucharist, Jesus’ very body and blood. There’s only one place you can get it (with a few exceptions like hospitals and prisons) and that’s at mass. You must attend mass to put yourself in the proper frame of mind to receive the gift of Jesus Christ both in the Word and in the Eucharist. If you don’t see the value of that, or if, God forbid, you don’t believe He’s really there, then there is a serious gap in your Catholic education. Here’s the thing. If Jesus came back. If He made appearances on television and invited you to come to Him, what would you do? If you knew that He was going to show up at a local stadium and save everyone in attendance wouldn’t you put on your best clothes and go to that stadium hours early to be sure you got in. Even if He was going to be 100 or 200 miles away, wouldn’t you make the trip? Yet He does show up every Sunday in your local parish church. You don’t have to drive 200 miles. You don’t have to get there hours early. You don’t even have to dress up (though that would be nice). Jesus has made this salvation thing so easy it’s not out of the reach of anyone. Yet 70% of the people who call themselves “Catholic” can’t be bothered to show up at His house for one hour once a week. I want to go to heaven. I want you to go to heaven. I want everybody to go to heaven. Jesus has given us this gift. Does it really seem like such a burden to show up at His house once a week and say “thank you”? Believe me, I’ve heard all the arguments. In fact, for several years I used them myself. “I don’t need to go to church.” “I can talk to God anywhere I am.” “Why do I have to go to a special building?” You can’t kid me because I’ve been there. Besides, you don’t have to kid me. I’m not the one who’s going to be there at the final judgment looking you in the eye and asking “Where were you?” Fortunately for me, I woke up before it was too late. I know that I’m preaching to the choir here. I doubt that anyone who reads this blog isn’t a regular church-goer. But the statistics tell us that someone you love who has stopped going to mass. You can give them a great gift by encouraging them to come back to the Church. Feel free to share this post with them. Maybe if they won’t listen to you, they’ll listen to a third party. Whatever we do, it’s vital that we reach the ones we love before it’s too late. Now to the second question, “How are these nominal (name only) Catholics hurting the Church?” That’s simple. Jesus didn’t just tell us what to do, He led by example. Non-Catholics, especially those who have an axe to grind with the Church, look at everyone who calls themselves Catholic trying to catch us doing something wrong. When people who don’t go to mass, people who say abortion is ok, people who constantly criticize the Church claim to be members it gives our enemies the ammunition they need to attack the Church. You’ve heard the statistics. “Most Catholics don’t support the Church’s position on ___________________ (fill in the blank).” If that’s true then the Church must be wrong. The trouble is that pollsters ask respondents to self-identify their religious affiliation. If they phrased the question differently, asking if the person was a regular mass attendee the results would be much different. Sadly, many of these former Catholics have a problem with the Church. To tell an interviewer that they belong to the Church but disagree with its teachings may be their little act of defiance. Bottom line, from a former nominal Catholic, nothing can substitute for attending mass and receiving Jesus’ Body and Blood in the Eucharist. Thats where Jesus is and that’s where we should be. Then, it’s our turn. We respond to the first reading “The Lord has done great things for us; we are filled with joy!” “Although they go forth weeping, carrying the seed to be sown, they shall come back rejoicing, carrying their sheaves.” Are you beginning to see a pattern? In the second reading, Saint Paul writes to the Philippians, “Brothers and sisters: I pray always with joy (there’s that word again) in my every prayer for all of you.” Remember, Paul has visited Philippi and he’s writing to them after he’s gone, reminding them of the great gifts they have received. Four readings, all with the same central point. We should be filled with joy. Here we are at the 2nd week of Advent. Jesus is coming! He’s coming to save us. We’re floundering in deep water and He’s the life boat. All we have to do is reach out to Him and we’re saved! We should be the most joyful sons-of-a-guns on the planet. What has He done for us? He’s sent His Son to become one of us and to die so that our sins may be forgiven. What more could anyone do? Jesus has paid the ultimate price for you and me. If we follow His instructions and His example, we have faith that when this life ends, we’ll go to heaven. We come to mass to praise and worship God. We come to give Him thanks. We come to receive His very Body and Blood. We had a wedding here Friday evening. I love to do weddings. Everyone is dressed up. They’re all smiles. They’re taking pictures because they want to remember the day. It’s a happy occasion. It’s also a sacrament. It’s the only sacrament I can think of where the congregation bursts into applause when the sacrament is performed. Now, ask yourself, “are you filled with joy right now?” You just said you were, five times. “The Lord has done great things for us; we are filled with joy!” That’s what you said. I heard you. Did you mean it? If not, then maybe you should prayerfully consider what’s happening on this altar. Did you know that mass actually begins when the second person gets here? It’s true. That’s what the Church teaches and it’s what Jesus meant when He said, “whenever two or more are gathered in my name I’ll be there.” That’s all it takes, just two and He’s here with us. So, what do you do when you get here? Do you prepare yourself for the miracle you’re about to witness? Do you kneel before God and ask Him to put you in the right frame of mind for the liturgy? Do you look over the readings and pray for understanding? Do you greet your friends and any visitors who might be here? All worthy ways to spend the minutes before mass considering that Jesus may be sitting right next to you. Or do you spend your time in church gossiping and talking about others behind their backs? Or do you silently pass judgment on those around you? C’mon, you know what I mean. Maybe you’re critical of the way someone’s dressed. Maybe somebody’s child is making a little too much noise. Maybe, and this is surely one of the greatest sins of all, maybe someone is sitting in your seat! Yikes! We should recognize this great church as the holy place that it is and act accordingly. We should be welcoming to friends and strangers alike. We should participate in the recited prayers and the sung prayers. 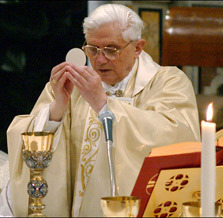 We should see that the sacrament of the Eucharist is just as exciting as the sacrament of matrimony.